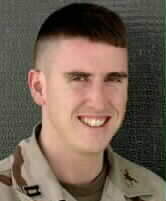 Captain Christopher J. Sullivan, 29, of Princeton, Massachusetts, died January 18, 2005, in Baghdad, Iraq, when an improvised explosive device detonated near his parked vehicle. Sullivan was assigned to the 1st Battalion, 5th Cavalry Regiment, 1st Cavalry Division, Fort Hood, Texas. Army Captain Christopher J. Sullivan was a protector and always tried to keep his family and friends from worrying, often telling them the situation was not as grim as it appeared in Iraq. Amy Lilley, Sullivan’s sister from Scarborough, Maine, said she had heard from her brother on January 10, 2005. ”We were passing around joke e-mails,” she said. He was scheduled to return home to his wife and son in a few weeks, the government reported. Sullivan had been working as an armor officer, in charge of the tanks and vehicles in the field, said Maureen Ramsey, a public affairs specialist for the Defense Department. He had entered the Army in March 1998 and had taken on the responsibility of company commander, leaving a job at headquarters. He also had served in Kosovo and Germany. Sullivan felt it was important to thank veterans who had preceded him and always emphasized that soldiers in Iraq were proud to serve, his family said. Sullivan’s interest in military service started early. At age 14, he joined the Civil Air Patrol. He served in the ROTC while attending the University of Massachusetts at Lowell, where he majored in mechanical engineering. He sought to continue the family tradition of military service, following the path of his grandfather, father, and two uncles. First and foremost I would like to extend my most sincere thank you to Dorothy to requesting that I be the one to carry Christopher’s stone up to Baxter Peak as a part of the first “Team Gold” team. It was a great honor and absolute pleasure to be selected by you to keep Christopher’s memory alive and well. I know I will never forget about Christopher after this incredible demanding hike. I would like to thank Christopher personally for helping me get through this hike. At the start of the day I was so sure and certain that I was physically and mentally prepared for the task at hand. As the morning went on I soon found out that I had caught some type of bug and my stomach was not feeling well at all. But I kept thinking of getting Christopher to Baxter peak. That was the mission, and I was going to accomplish that mission. With each step I felt slower and slower but kept on. I owe that to Christopher. I wouldn’t have made it all the way to Baxter peak without his help. I feel like I learned a lot about Christopher from your email as well as some other sites, but a few things you said about him really stuck with me. From what I could tell, Christopher was the textbook definition of a “military lifer.” He learned about Patriotism and honor and duty and sacrifice from his elder family members and kept that tradition on even as a young child. I could picture him reading his new christmas books and analyzing all the specs on the tanks and jet fighters in the books you would get him. Then starting his next step by joining the Civil Air Patrol and ROTC programs at various levels in school. I cannot say enough words to thank Christopher for his service and sacrifice with his military service. It was a great honor to learn about your son and hike up to the top of Maine, where he and his sister went one summer. I will never forgot about Christopher and I will remember his story and the strength that he gave me to conquer the task. With all my love, thank you for requesting that I carry Christopher’s stone. It was a distinct honor to carry Chris’ stone at Acadia. I carried Chris along with one of my fallen comrades. We all served in Iraq at the same time which is just one of the connections I discovered about Chris. Another connection I made was that he and I were both from Massachusetts. And as I told you when we met I had the privilege of carrying Chris’ stone down Mount Katahdin for a sick hiker back in May. I’m not going to lie, Chris’ stone has some weight to it, and I could feel it the whole time. Like a typical company commander he was pushing me to do my best. Thank you for being a part of The Summit Project and thank you for sharing Chris’ memory with us. My name is Calvin Peck and I’m a sophomore at Nokomis Regional High. Every year the JROTC program at the school takes the sophomore class to do the summit project and climb a mountain. The summit project is a great experience and overall a great program because it helps us to remember the fallen. Even if we can’t remember all of them, you will never forget the story of the stone you carry. This year I had the honor of carrying the stone of U.S. ARMY CPT Christopher J. Sullivan, up Tumbledown mountain mountain in Franklin county Maine. I chose this stone because I wanted to carry a stone from the ARMY and he was an officer. The morning of the climb we all loaded on to the bus around 8:00. By the time we got to the mountain it was around 10:30. My group was the first to get to the pond, in between the two peaks, where we waited for the others to catch up. Once everyone was there we headed up to Tumbledown peak. Once we were all there we removed our stones from our packs and began talking about our stones. Listening to everyones story was sad but it was important to hear their story and remember each person. Before we went on the climb I researched Christopher’s life. Christopher James Sullivan was 29 years old and was from Princeton Mass. He started showing interest in the the service at the age 14 where he joined the Civil Air Patrol. He attended the University of Mass in Lowell where he was in ROTC. He joined the ARMY in March of 1998 and shortly after became a company commander. He often emailed his family telling them the things were better then they were so they wouldn’t be worried. He died Jan 18 2005 in Baghdad Iraq when and IED detonated near his vehicle. He was supposed to return home in just 2 weeks. It was an honor to carry the stone of CPT Chris. J. Sullivan this year. CPT Sullivan was a good man and gave it all to protect our country so It was good to be able to share his legacy even just a little bit with the few people I was with. Thank you, rest in peace Christopher. Thank you Calvin for carrying Chris’s stone and for your message. Chris’s Birthday was yesterday, finding your message today brought me joy, it means so much to know Chris is not Forgotten. I’m sure you would have liked him, he was a good friend to many, was dependable and had a great sense of humor. I had the honor and privlidge to carry the stone of Army Captain Christopher James Sullivan. Battallion, 5th Calvary Regiment, 1st Calvery Division Fort hood Texas. At a young age Christopher joined the local Civil Air Patrol and served with the ROTC in college. He belived it was important to thank and show appreciation for our Vetrans. He was proud to serve and often downplayed how bad it could be while he was deployed so his family would not worry as much. Christopher was a son, father and husband. He loved his family very much. He was killed a few short weeks before he was supposed to come home. He had always made sure to take care of his men; He made it a priority to make sure they had everything they needed. This was my 2nd T.S.P. I am still amazed at the bravery and gratitude of the Gold Star Families. The day was beautiful and set the tone for the mission ahead of me. Team Bubble hiked Pemetic North Ridge trail – it is rated as a strenuous. From taking the first step on the trail I could feel Christophers stone resting on my back. As we climbed I was humbled to be going up the trail. Thinking of the courage and bravery and the sacrifice of Christopher and his family. We had two young kids on our team, it was quite amazing to watch them push through with no complaining so they could complete the mission in order to tell the story of their stone on the top of Cadilac. When we reached the top there were a lot of people. As we gathered in our sharing circle the amount of patriotism and gratitude was so overwhelming it was like we were the only ones there. I learn so much everytime. I was lucky enough to meet James and Dorthy Sullivan. They were so kind and welcoming and shared stories and how much they loved and how proud they are. Dorthy gave me a pin with Christopher’s picture on it. I have it near my desk so I am remined of the sacrifices made by these brave soldiers and families so we can live in this amazing country and to be able to vote and have the freedom and choices that not everyone on the planet does. I will continue to tell his story.